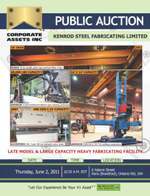 Corporate Assets Inc. | Kenrod Steel Fabricating Limited - Corporate Assets Inc. FEATURING: ACCURPRESS (2007) 740014 press brake, ARONSON (1982) 14' X 14' welding manipulator, ARONSON 60000 lbs. welding positioner, KENROD 42’ custom traveling sub arc welding system, PEARSON 175 ton X 12’ hydraulic press brake, PEARSON 100 ton X 12’ hydraulic press brake, SERGI initial pinch hydraulic plate bending rolls, PEARSON 10’ X .25” hydraulic shear, IRCO 10000 lbs. welding positioner, IRCO 1500 lbs. welding positioner, LINCOLN IDEAL ARC DC 1000 internal circumferential welder, (20) MILLER DELTAWELD 452 MIG welders, (4) LINCOLN POWERWAVE 450 MIG welders, 2) MILLER MAXSTAR 200 TIG welders, HYPERTHERM POWERMAX 1650 plasma arc welder, LINDE PCM 121 plasma arc welder, LINDE PCM 150 plasma arc welder, IRCO 10000 lbs. tank turning rolls, DOALL TF 20 tilt frame hydraulic vertical band saw, MARVEL SERIES 8 tilt frame hydraulic vertical band saw, MUNK (2002) 56', 10 ton double girder bridge crane, CLARK 10000 lbs. LPG forklift, HYSTER 7800 lbs. LPG forklift, HYSTER 7000 lbs. LPG forklift, YALE 8000 lbs. LPG forklift, (12) 2 ton hoists, large quantity of heavy duty steel plates, raw material inventory, machine shop and fab equipment, factory equipment, office furniture and more.